T-Mobile is working harder to make their customers happier. Today in a blog post, T-Mobile’s CTO Neville Ray answered questions for T-Mobile’s 4G future plans. iPhone and unlocked devices on T-Mobile will be compatible with T-Mobile’s HSPA+ network. The CTO also says that they won’t eliminate their 2G network in the future, like AT&T is trying to do. A nice side benefit of the refarming effort is that our 4G network will be compatible with a broader range of devices, including the iPhone. The other important benefit of our network modernization effort is the coverage improvements it will deliver, especially when it comes to in-home coverage. T-Mobile’s customers will also see the fast download speed of 4G LTE next year, according to Neville Ray. There several cities in that already have T-Mobile’s HSPA+ including Abilene, Amarillo, Odessa, and Victoria, Tex; Bakersfield, CA; Eau Claire, Wis.; Joplin and St. Joseph, MO. So if you’re in one of the cities that T-Mobile has refarmed their PCS spectrum and have an unlocked iPhone on T-Mobile, your iPhone should be receiving 3G speeds right now, as reported back in December. 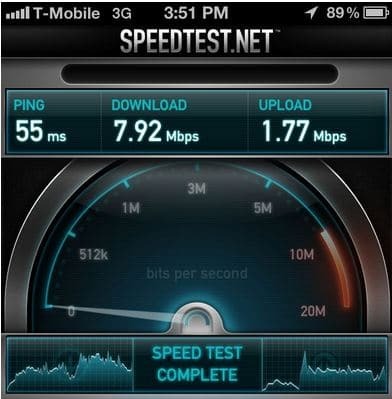 The speed reported by those who were able to receive 3G speed on their iPhone from T-Mobile, showed that T-Mobile speed on the iPhone is three times faster than Sprint’s current 3G speed for iPhone. Currently any unlocked iPhone, even if the phone is factory unlocked from Apple, won’t receive any data from T-Mobile other than 2G speed unless T-Mobile has refarmed their spectrum on your city.